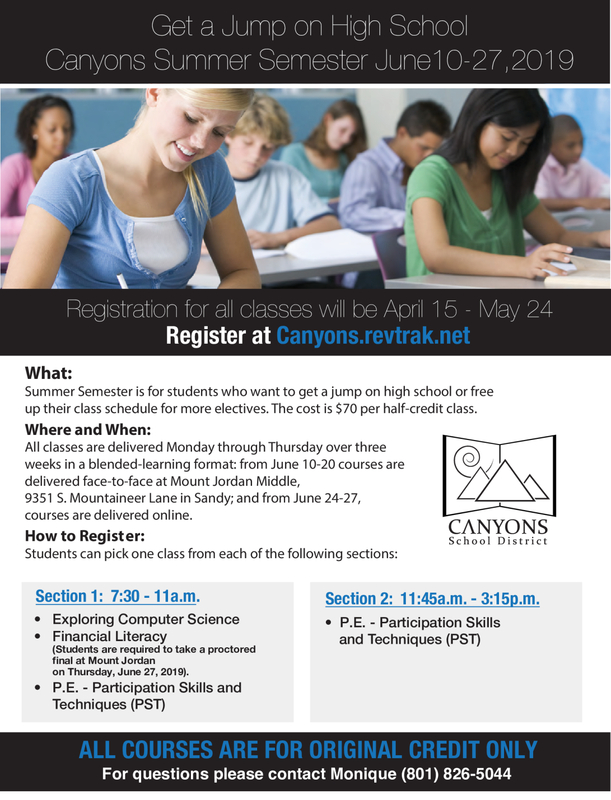 Canyons Summer Semester is for students who want to get a jump start on high school or free up their class schedule for more electives. The cost is $70 per half-credit class. Classes offered are: P.E. Participation Skills & Techniques (PST), Financial Literacy and Exploring Computer Science. Registration will be help April 15th - May 24th. Click here to view the flyer. Click here to register. At Jordan Summer School you can make up .25 credits in 4 days. Classes offered are: ELA 9, ELA 10, and ELA 11 ; Biology, Earth Science and Chemistry; Geography, World Civilizations and US History; Secondary Math 1 and Secondary Math 2; Financial Literacy and Digital Business Apps. The cost is $35 per quarter credit. Multiple sections are available. Sign-ups are open April 1st - May 17th. Click here to view the flyer. Click here to sign up. ​Summer classes at SLCC offer an excellent way for students to earn college credit while fulfilling high school graduation requirements. The SLCC Summer Course Schedule is now available here. ​In order for a student to take summer college classes at SLCC, s/he must be admitted to the college and complete the “Early Enrollment” paperwork. The link for Early Enrollment instructions/forms is here. Please notice that one of the criteria is that students must meet with an academic advisor at SLCC. If a student has already participated in Early Enrollment courses, a second meeting with an advisor is NOT required. Summer courses will fill quickly, and they are offered on a first-come, first-served basis. Also, please be aware that all college courses are FULL TUITION during the summer term. (“Concurrent Enrollment” prices are available only during the academic school year). Many summer courses are available “online” which allows for flexibility, but these are also charged at full-tuition rates. If you have any questions regarding the summer classes offered by SLCC, please contact Wayne Dittmore, CTE Coordinator at CCHS, 801-826-6441. Camp MD is a 4-day summer camp ran by medical students from the University of Utah School of Medicine. The camp is designed to give high school students a glimpse of what it is like to be a medical student and gain exposure to various fields of medicine. Deadline to apply is March 29th. For more information and to apply, please visit their website. Utah Business Week (UBW) is an experience you don’t want to miss! UBW is a week-long summer program that gives high school sophomores and juniors real life business experience. Students learn business tactics from top industry professionals while participating in a business simulation. UBW is hosted at Utah State University in Logan from Sunday, July 28 through Saturday, August 3, 2019. Students stay in the dorms and participate in a variety of fun activities on campus. On top of great business experience, UBW is a fun way to get a feel for what college life is like. For more information and to apply, click here. Cost is $100 if accepted. Deadline to apply is May 31, 2019. This is an exciting opportunity for aspiring young executives and entrepreneurs at the Early Executive Leadership Academy this summer from July 29 - August 1, 2019! Discover firsthand what majoring in business is all about where YOU choose the track: Money, Entrepreneurship, or Technology. You’ll learn from and rub shoulders with big named leaders, participate in fun activities with faculty, staff and our student leaders EVERY DAY, win prizes up to $100 and make the experience real by staying on campus. This is a once-in-a-lifetime opportunity to have front-row access and a hands-on experience like never before. This academy is for ages 15-18 and it's Free. Registration deadline is May 14th. For more information and to register, click here. University of Utah offers weekly half or full day (until 4 pm) classes that provide students with a jump-start on college by offering unique opportunities to study, learn, and explore The University of Utah with their friends and peers. Classes include major exploration, science & technology, art & music, engineering & math, test prep, high school for credit classes and more. Click here to view the list of classes. Summer Transportation Institute Camp. Explore engineering in this week-long event dedicated to introducing 2019-20 9th grade high school students to the transportation industry. Participants will experience hands on activities while working with the professional researchers and faculty of the University of Utah. Participants will have the opportunity to experience on campus amenities, field trips and explore career opportunities while focusing on science, technology, engineering, and math (STEM) fundamentals. This is a non-residential, free of charge five-day event. Lunch and transportation provided during camp hours. ​For information and to register, click here. University of Utah Engineering department offers great engineering classes this summer for high school students. Classes include Hi-GEAR (Girls Engineering Abilities Realized, Exploring Engineering Camp, Intro to Entertainment Arts and Engineering and more. Click here to get all the information. Weber State is offering multiple summer camps this year. Camps include Medical Academy, Video game design, 3D printing, Metalwork and more. Click here to get all the information and register. UVU’s summer camp includes courses for students of all ages in subjects like arts and crafts, aviation, science and engineering, education, computer science, 3D animation, theatre, and robotics. To get the listing of all classes, dates and prices, click here. TECS (Technology, Engineering, and Computer Science) Summer Camp will take place at SUU June 10 - June 13th. This camp is for Sophomore and Juniors. Students will choose a track, which will determine what they will be learning at the camp and which professors they will be working with. Each Track was designed and is taught by one of SUU's professors. Tracks are: CAD/CAM, Mechanical and Aerospace Engineering, Robotics, Cyber Security. Cost is $175 for Program tuition and $350 for Room and Board. Scholarships are available. For more information and to register, click here. Take part in a three-week comprehensive leadership experience with opportunities to work collaboratively with others. Spend time on campus, learning about your leadership style and unique strengths. After developing a solid skill base, apply these leadership skills when you join Club U camps to shadow the counselors and better understand the real life dynamics of leadership in a summer camp setting. Design activities for Club U Campers in the third and final week. Step into the camp experience for a more prominent role and take the reins to lead activities with the campers! After you complete the L.I.T. program, you will have the opportunity to volunteer in Club U as staff aides throughout the summer. And who knows, this may translate into employment next year! Leadership in Training takes place June 10 - June 28th. Tuition is $245.00 + Special Fee: $165.00 = $410.00. For more information and to register, click here. Biotechnology Summer Academy exposes high school students to the numerous career opportunities available in biotechnology. Students are mentored by USU faculty who work in various disciplines. The week’s activities include communication workshops, lectures and demonstrations, laboratory training, field trips, mentoring and research. This intensive five-day internship will take place June 24-28 at University of Utah. This program is for juniors and seniors interested in bioscience, medicine and engineering. The cost is $200 and includes five days of room and board. Deadline to register is May 31st. Click here for more information and to register. Learn how to Hack, Design, Code & Make at Girls Go Digital this summer. GGD uses hands-on activities to teach computer science and technology to girls, ages 8-18. Any level of interest and experience is welcome. Classes include computer programming, micro controllers, pixel art, digital photography, e-textiles, web design and more. Girls are grouped in classes by age and experience. Classes take place at different locations. Cost $295 for 4 days. For more information and to register, click here. Code to Success is a free 6 week coding class. Learn four languages in six weeks! It takes place June 10th to July 19th. The locations are through out Salt Lake, but CCHS students will most likely attend Jordan High Campus. Click here to read all about this class and to register. BYU offers Performing Arts summer workshops and camps including: ballet, choir, theater, dance, ballroom, voice and more. They also offer ACT Prep, coding classes, Design Week, French and Arabic language camps, Teacher camps and more. For all the details, click here. Here are some out-of-state programs that you might be interested in. Discover what it takes to succeed in the world of games and tech. Learn coding, animation & more from industry experts. Take charge of your role either as a designer, coder, artist or project manager while creating your own game. You'll realize what role you want to pursue the most, and if you want to pursue game development at all. Summer STEM camps are offered in two gaming hubs, Seattle or LA and are for ages 12-18. For more information, please visit their website. Learn the craft behind the dream and discover where you fit in the fashion world. Whether you want to pursue fashion for a career or just for fun, we’ll equip you with the skills and confidence you need to succeed. Project Fashion summer camps are held in LA. For more information, please visit their website. Summer College (students currently in grades 10 – 12) - Take a credit-bearing Duke University course during this four-week program and experience the life of a Duke student. Summer Academy (students currently in grades 9 – 12) - Choose from any of our transformative three-week certificate courses and become a leader in an ever-changing tomorrow. Accelerated STEM Academy (students currently in grades 9 – 12) - Experience the life of an elite researcher by touring Duke’s premier research facilities, participating in a variety of hands-on labs, and engaging with Duke faculty members during this one-week program. ​Apply online today on each program’s homepage, as spots fill quickly! At John Hopkins University, our summer programs are your head start on college, with enriching classes taught by a world-class faculty. And you earn full academic credit with every class. Live in residence halls or commute to campus as you make new friends from around the world and explore Baltimore - a city renowned for its culture, cuisine, and charm. John Hopkins offers one, two, and five week classes that can help you fit summer learning into your busy summer. To see the list of all programs offered, visit their Summer Programs page. At Stanford University, our programs offer highly motivated, intellectually curious students the opportunity to investigate topics not typically taught in secondary schools. Students engage in small classes taught by instructors who are experts in their fields and passionate about teaching. In this setting, students hone their academic skills and form new friendships with intellectual peers. Students in our residential programs get a taste of college life on the beautiful Stanford campus. Past students have described their Stanford Pre-Collegiate Studies experience as life-changing. We offer programs for students in grades 8-12. For a full list of programs and to register, visit our Academic Enrichment Programs page.